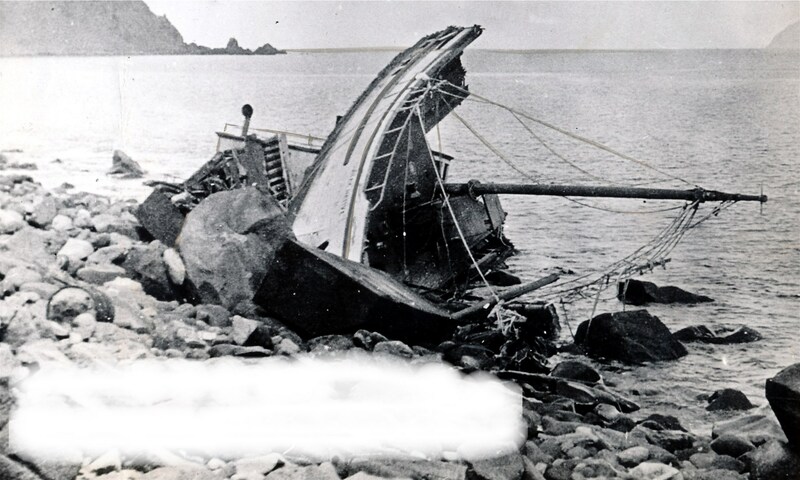 F P 3 (1941) The 33 ton 60 foot wooden scow F P 3 stranded and was lost in Pavlof Bay October 22, 1941. There was no one aboard the scow at the time of the casualty. FAIRMONT (1976) The 34 foot vessel Fairmont burned and sank August 22, 1976 near Port Bailey. FALCON (1950) The 26 ton 45 foot wooden oil screw fishing vessel Falcon foundered 10 miles east of Mitrofania Island on May 2, 1950. FALCON (1964) The 10 ton 30 foot wooden oil screw fishing vessel Falcon was destroyed by a tidal wave March 27, 1964 at Seward. FALCON (1964) The 17 ton 35 foot wooden oil screw fishing vessel Falcon was destroyed by a tidal wave March 27, 1964 at Seward. FALCON (1969) The oil screw Falcon was consumed by fire June 19, 1969 in the harbor at Sand Point. FALCON (1970) The oil screw seiner Falcon foundered and was lost August 13, 1970 a mile and a half northwest of Hanin Rocks just north of Kodiak. Bill Gerow of Boston MA was lost in the disaster. 11 others on board were rescued. The Falcon was traveling from Larson Bay to Kodiak. FAR NORTH (1956) The 8 ton 30 foot wooden gas screw fishing vessel Far North was consumed by fire August 1, 1956 in Prince William Sound. Hunter lists the value of the Farallon at $75,000 and her cargo at $2,000 both total losses. FARWEST (1967) The gas screw Farwest foundered June 19, 1967 at the Copper River southeast of Cordova. FAST LADY (1993) The 46 foot salmon seiner Fast Lady was consumed by fire July 27, 1993 at Chignik. No lives were lost. FAVORITE (1915) There were two guests and three crew aboard the gas screw Favorite when she stranded on Hinchinbrook Island at 5: p.m. August 16, 1915. Master and owner Bing Halleck attributed the casualty to engine trouble during an 80 mile an hour gale which forced the Favorite ashore. The vessel had departed Douglas July 28, 1915 destined for Warm Spring Bay with 6 ½ tons of general merchandise aboard. Passengers and crew all survived the stranding but the Favorite and her cargo were totally lost, with no insurance. The vessel was valued at $2,200 and her cargo at $2,600. All five survivors were taken aboard the Light House Tender Kukui at 5:00 a.m. August 21, 1915. FEARLESS (1960) The 145 ton 90 foot wooden oil screw fishing vessel Fearless foundered January 31, 1960 off of Cape Chiniak. Four persons were reported lost with the vessel which was returning to Kodiak from the southeast end of the island with a load of King Crab. Lost were skipper Orville O Sandvik (49) of Seattle, Clyde Welcome(48) of Anacortes, Howard Benner (50) of Bellingham and Peter Wolkoff Jr (23) a native of Kodiak. FEARLESS II (1974) The 32 foot vessel Fearless II sank March 8, 1974 in Shearwater Bay. FENWICK (1993) The 57 foot longline halibut fishing vessel Fenwick flooded and sank June 10, 1993 approximately 40 nautical miles south of Homer. All seven persons on board were rescued. FERRO (1917) The 5 ton 35 foot wooden gas screw Ferro went adrift, dragging two anchors ½ mile off the west side of Middleton Island March 22, 1917. According to Jacob Ivach of Ketchikan, master and owner of the Ferro, the vessel drug her anchors during a heavy gale from the NE. The gas screw Helgeland attempted to tow the Ferro but was unable and the vessel was set adrift into the dark snow filled night. The Ferro was carrying 1,500 lbs of general cargo worth $500 which was lost along with the Ferro worth $3,000 at the time of the casualty. Neither was insured. The two person crew survived. FERRY QUEEN (1953) The 62 ton 65 foot wooden scow Ferry Queen foundered October 7, 1953 in Iliamna Bay, Cook Inlet. FIDELITY (1964) The 48 ton 59 foot wooden oil screw fishing vessel Fidelity was reported lost at Kodiak in the Good Friday earthquake of March 27, 1964. FIERCE COMPETITOR (1994) The 105 foot crabber Fierce Competitor went missing in the Gulf of Alaska October 26, 1994 with five crewmembers on board. Lost were skipper Robbie Simonsen (39) and his wife Vickie along with Larry Jones (37), Keith Young (31) and Gordon Young (18). Most of the crew was from Warrenton, Oregon. The vessel’s life raft was spotted 450 miles southeast of Kodiak 50 miles from where an EPIRB signal had been heard. Heavy weather prevented retrieval of the raft, but no signs of life were reported. FISH MULE (1957) The 34 ton 46 foot steel oil screw tug Fish Mule foundered December 25, 1957 at the entrance to Resurrection Bay. FLAMINGO (1964) The 11 ton 31 foot wooden gas screw Flamingo was destroyed by a tidal wave March 27, 1964 at Seward. FLATTERY (1951) The 12 ton 36 foot wooden gas screw fishing vessel Flattery was consumed by fire August 7, 1951 at Cordova. FLEET COMMANDER (1989) The 32 foot salmon fishing vessel Fleet Commander got caught in heavy weather with a full load of lumber, capsized and sank June 2, 1989 southeast of Chisik Island. The vessel was hauling freight from Kenai to Chinitna on the west side of Cook Inlet. Laura Murphy was lost. Owner operator Paul Traxinger managed to climb into a life raft and drifted into Dry Bay 27 miles from the capsizing. FLINT (1957) The 35 ton 52 foot wooden oil screw fishing vessel Flint stranded and was lost September 1, 1957 outside Womans Bay Channel, Kodiak Island. FLYIN’ LION (1993) The 30 foot seiner Flyin’ Lion capsized and sank June 24, 1993 in the Egegik River. An improperly connected towline was blamed for the disaster. All three crewmembers were rescued. FLYING CLOUD (1949) The 105 foot power barge Flying Cloud stranded off of Grass Island in the Copper River Flats February 22, 1949 with four persons aboard. Leonard Holeman, the engineer of the vessel hiked 30 miles through sloughs and waist deep snow to get help. The vessel had departed Cordova for Seattle where it was to be outfitted for cold storage. The heavy southeasterly winds, sleet and snow forced the vessel ashore. Holeman fashioned snow shoes from spruce branches in order to plow through the deep snow to seek aid for the other three persons aboard. All were eventually rescued. FLYING SCUD (1886) The 25 ton 50 foot wooden schooner Flying Scud was lost with 26 souls between Cape Douglas and Kodiak in November of 1886. The schooner departed Douglas Station near Cape Douglas November 14, 1886 bound for Kodiak. On board were owner Captain H Anderson, master Nels Hansen, Vasilli Griznoff, Vassili Griznof Jr., 15 native hunters from Afognak, Akhiok and Karluk and the Wife and five Children of John W Smith, the Alaska Commercial Company’s agent at Douglas Station. The Smith children ranged in age from a toddler to a girl of 17. The Flying Scud never made it to Kodiak even though weather was reported fair when she departed the Alaska Peninsula. The company agent at Kodiak, not knowing that the vessel had departed the Cape Douglas area for Kodiak in November, reported that all was well and the Flying Scud busy hunting into the winter. It was not until broken bidarkas and wreckage was found on area beaches many weeks later that the alarm was sounded. The weather had been particularly cold and severe that winter. The reality of the loss was not fully known or reported until the spring of 1887 when traffic between the outer settlements and Kodiak resumed, following the storms of the winter. The wreck report mentions that the 3 tons of stores, guns and ammunition aboard was saved. The Foam, valued at $400 was lost no insurance. FOG (1976) The 28 foot vessel Fog was reported to have foundered December 11, 1976. FORCE FIVE (2000) The 32 foot aluminum salmon fishing vessel Force Five was consumed by an engine room fire and lost July 13, 2000 near Port Moller. Both crewmembers abandoned ship and were rescued by another vessel. FORT YUKON (1981) The barge Fort Yukon was lost in rough weather August 20, 1981 approximately 60 miles southeast of Yakutat. FORT YUKON (2007) The 197 foot steel fish tender barge Fort Yukon stranded and was lost on Titcliff Island outside of Wide Bay November 27, 2007. The F/V Ladie Blackie had the Fort Yukon in tow in Wide Bay November 27, 2007 and was attempting to dewater and repair the barge. High winds and seas forced the two vessels between the islands outside of Wide Bay. The Ladie Blackie lost power when water plugged her fuel filters and she grounded on shoals. The tow line parted and the Fort Yukon drifted free. A day later she washed up on the beach on Titcliff Island and was lost. The Lady Blackie was lost as well. There was no loss of life. FORWARD (1964) The 22 ton 47 foot wooden oil screw fishing vessel Forward was destroyed by a tidal wave March 27, 1964 at Kodiak. FOSS 209 (1975) The barge Foss 209 overturned while in tow of the Leslie Foss September 26, 1975. She was towed 60 miles off shore near Cape Saint Elias and sunken with explosives. FOX RIVER (2000) The 116 foot landing craft Fox River caught fire in her engine room at 3:30 p.m. November 29, 2000 while traveling on a hunting trip to Shuyak Island. The two persons aboard, Willie Flyum and Allen Smith, were unable to radio for help as the fire spread to the wheelhouse where the radios were. The men activated one of the vessel’s Emergency Position Indicating Radio Beacons and donned survival suits. The signal was picked up at 5:39 p.m. and a U S Coast Guard helicopter went in search of the distressed vessel, not knowing the circumstances. Winds were blowing at 30 miles an hour and seas were 15 feet. Using night vision goggles, the Coast Guard chopper was able to locate the smoldering Fox River and evacuate the two crewmembers from the deck. Both of their survival suit’s feet were melted. FOXFIRE (1990) The 30 foot wooden fishing vessel Foxfire burned and sank May 27, 1990 at Point Pigot in Prince William Sound. The only person aboard abandoned ship and was rescued by the vessel Azuma Searay. FRANCES K (1980) The 67 foot wooden diesel powered fishing vessel Frances K was lost with all hands May 18, 1980 approximately 25 miles south of Yakutat. The Frances K departed Pelican May 17 on a fishing trip with four crewmembers aboard. Wreckage was spotted the following day by the pilot of a light aircraft. Lost were John Holgate Jr. (20), Ron Tseifser (25-30), Tom Bears (20) and Tracy Beach (24) all from Haines. FRANCES LEE (1993) The 107 foot steel crab fishing vessel Frances Lee stranded near Knoll Point July 22, 1993 while traveling from Newman Bay to Alitak. All six crewmembers abandoned ship and were taken aboard the fishing vessel Macanaw. The Lucky Island, Midnight Sun and Resolution also responded to the distress call. Four of Frances Lee’s crewmembers returned to the stranded vessel with dewatering pumps from the Resolution and Midnight Sun. Others from the U S Coast Guard cutter Mustang and a Coast Guard helo assisted in the dewatering attempt. The tug Ardie and fishing vessel Barb M arrived on scene and assisted in removing fuel from the Frances Lee. The vessel was refloated and put in tow of the Ardie and Barb M in an attempt to take her to a more protected location for salvage. On July 25, 1993, during the salvage attempt, the Frances Lee capsized between Knoll Point and Twoheaded Island. The tow was taken over by the Coast Guard cutter Mustang who towed her out to deeper water and scuttled the Frances Lee in 50 fathoms using 112 rounds from her 25 MM guns. FREDERICK C (1966) The 73 ton 69 foot wooden oil screw fishing vessel Frederick C stranded and was lost June 8, 1966 east of Ocean Cape at 59 32 N 139 51 W.
FRIEDA (1964) The 67 ton 69 foot wooden oil screw Frieda was reported missing out of Port Bailey in the Good Friday earthquake of March 27, 1964. FRISCO (1972) The 26 ton 46 foot steel oil screw fishing vessel Frisco foundered October 24, 1972 approximately 11 miles southeast of Kodiak in the Gulf of Alaska.